Ketsara was an outstanding guide for our trip Nov 17-29. She worked to make sure that each individual had the experience heshe was looking for. When we expressed an interest in going to Jim Thompson House in Bangkok, she asked if anyone else was interested and took us on the ferry and skytrain on her time off. In Chiang Mai, she arranged for a minivan to take us and several others to a hilltribe village nearby. She went above and beyond in her attention to all members of the tour. We were nervous due to the low cost, but the tour was a fun, safe, and organized experience. The tour guide was amazing and very helpful. During the tour I knew it was one of the best tours I'd taken. And I simply adored Ketsara from the moment she greeted us at the airport. But it wasn't until I began to relive the trip through my pictures that I realize how amazing, educational, and fun the tour was. I am seriously considering doing it again. I had such a great time. Ketsara the tour guide was one of the best I've ever had. She went out of her way to be sure the group tried everything and had options to have the most full experience possible. Amazing Thailand was made phenomenal because of our guide Ketsara who attended to all our personal needs and request and interacted with each of us individually; Ketsara is profoundly knowledgeable about her beloved Thailand and willingly shared her love and knowledge. Our tour 19-27 April, 2016 was a fantastic "Enchanting Peru" experience. We started in Cuzco with rain showers during our shaman blessing, but the weather was unbeatable the rest of our stay. Dagmar was our tour guide with Abel assisting at Lake Titicaca. Both were extraordinarily good with historical and site information, restaurant recommendations, free time suggestions and shopping ideas. We could have not been more blessed with our hosts, our accommodations and our itinerary. Truly a great experience for all. Your exotic journey to Thailand begins as you depart today aboard your wide-body jet. Welcome to Thailand, the “Land of Smiles”. Evening arrival in Bangkok, the breathtaking capital. You’ll be met by your Tour Director and escorted to your upscale hotel located on the banks of the Chao Phraya River. Special “orientation breakfast”, then embark on an included tour introducing you to some of the outstanding Buddhist temples in Bangkok. Visit Wat Trimitr with its invaluable 5-tons solid gold statue of Buddha and Wat Po, featuring the colossal 150 foot long “Reclining Buddha”. See the White Marble Temple representing the finest example of Thai architecture. Afternoon at leisure or join an optional canal boat ride across the river for a glimpse of local daily life ($30). This evening enjoy a welcome dinner. Two days at leisure to discover Thailand’s vibrant and exotic capital at your own pace. Your Tour Director can make suggestions for independent exploration. Join an optional excursion to the colorful Damnoen Saduak floating market, reached by a rice barge followed by a visit to Phra Pathom Chedi, the tallest stupa in the world ($45). 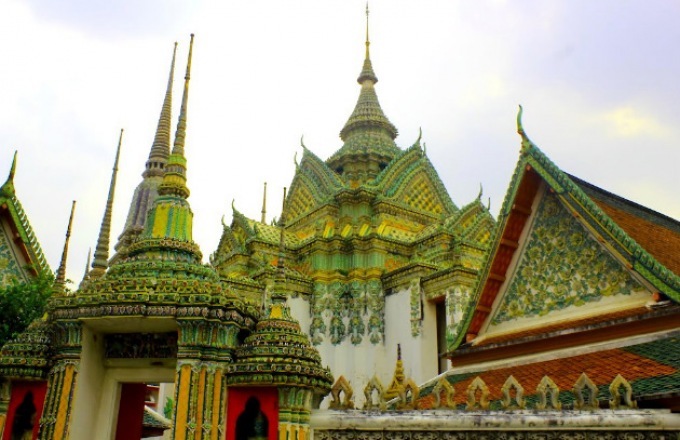 A tour of the spectacular Grand Palace, former residence of the Kings ($40) is also available. Both tours can be on either days 4 or 5 depending on the departure date. Continue to enjoy your independent exploration of one of the world’s greatest cities! Over the next few days venture into some of Thailand’s most fascinating regions, rich with culture, history and stunning landscape. In Ayutthaya, the ancient capital, see the giant bronze statue of Wat Mongkol Borpith and the three ancient pagodas at Wat Phra Sri. Continue to Lopburi to view the magnificent stone carvings of Phra Prang Sam Yod as well as the Monkey Temple. Drive via beautiful scenery of rice paddies to Phitsanulok, the gateway to Northern Thailand, visit the Bronze Case Factory and view how Buddha Images are made in an authentic way. Today travel to Sukhothai to see the famous ruins of this 13th century first capital of Siam. Visit the Textile Museum, a unique private collection. Continue to Sri Satchanalai, the northern outpost town of the Kingdom of Sukhothai, built by King Ramkamhaeng where you’ll visit an ancient Ceramic Kiln before proceeding to Lampang for overnight. Day 8: Golden Triangle/Chiang Rai. Day at leisure. Your hotel is located within easy access to the Mae Kok River. Today join an optional boat trip down the river and visit the fascinating local hilltribe villages, learn about their culture and observe the colorful costumes ($35). Day 10: Chiang Rai / Chiang Mai. Morning drive to Chiang Mai, the “Rose of the North.” Your hotel is centrally located within a short walking distance to the renowned night market. Afternoon at leisure. Tonight we suggest an optional “Kantoke Dinner” featuring local specialties as well as breathtaking performance of songs and dances by a local hilltribe dressed in traditional costumes ($35, dinner included). Today visit an elephant camp and see a demonstration of the role of the elephant in Thai agriculture, commerce and culture. Later visit an Orchid Farm. Afternoon at leisure to discover the charm and beauty of this ancient city. Morning optional city tour visits Chiang Mai’s most interesting temples as well as fascinating Wat Doi Suthep located high in the mountains ($30). Tonight, why not celebrate with your fellow travelers in an optional farewell dinner at a famous riverside restaurant ($30). Connect in Bangkok for your flight home. Your magical journey ends as you arrive the USA later today.